But out of all the craziness that’s been going on in my life, I can finally say that dad’s house will finally…FINALLY…be on the market this week!! This is only the beginning of the big process of selling a house, buying a house, and selling another house (ours). But there’s still our long weekend trip to Long Island. I’m super-excited!!! I hope we have great weather, and we’re going to Luna Park!!!!! My bucket list is going to have several check-offs that weekend!! It’s going to be much-deserved for the both of us; after all that we both been through the past year, this trip is going to be worth the wait! And since I’ll be wearing a bathing suit on vacay and it’s getting hot outside, it’s time we take a breather from all the baking and the Easter candy fallout and make veggie gyros! Mike and I enjoy going to the local Mediterranean cafe on lunch dates and eat gyros (Greek pronunciation: [ˈʝiros], or “heros”). I’m all about wraps of any kind really! They’re a quick lunch or a small dinner that you can easily prepare yourself. It beats having the same old bologna and cheese on plain bread. 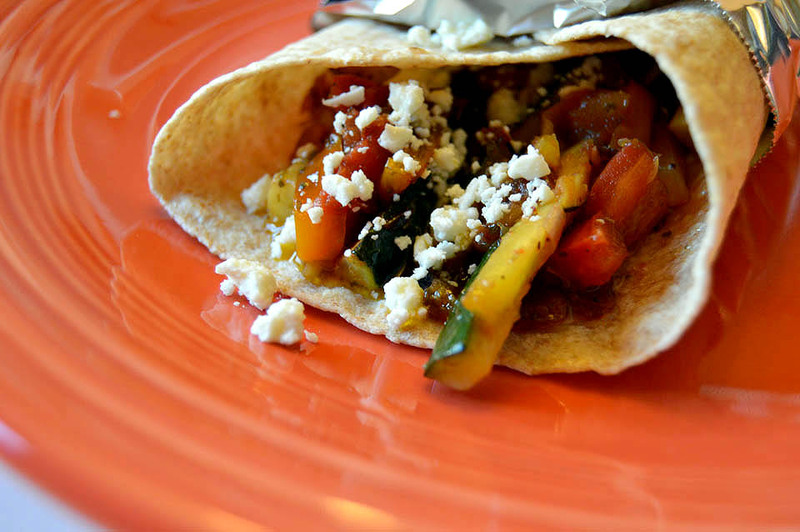 What I did here is kind of a copycat version of Taziki’s grilled veggie gyro, but the veggies were sautéed. It still has the yellow squash, tomatoes and zucchini in it, but I added a little more color to it (the orange bell pepper instead of a red one), and I whipped up a simple dressing that is also great for salads. I guess you can pretty much say it’s a homemade pesto aioli dressing. 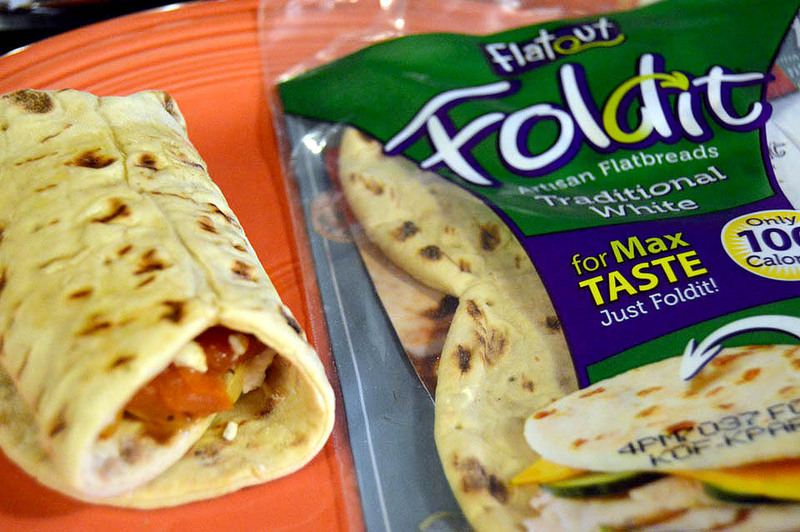 For assembly, I used the Flatout Foldit wraps and whole wheat flour tortillas. Either one is good, but I’m no super-expert at wrapping food, so don’t judge..LOL! You can also add some grilled chicken strips in there too, or throw in a different kind of cheese. You can’t go wrong with these gyros, and eating one won’t make you feel guilty if you need to fit into a bathing suit soon! 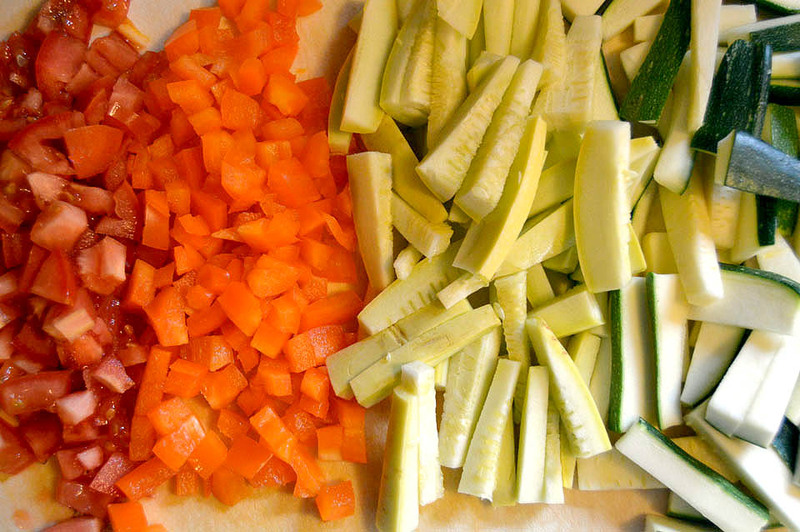 • Slice up all your vegetables and place in a bowl; set aside. • In a medium bowl, combine all the dressing ingredients; set aside. • Drizzle a medium skillet with olive oil, enough to cover the bottom of the skillet. Add the onion and cook for a couple minutes, then add the garlic; cook for a minute. 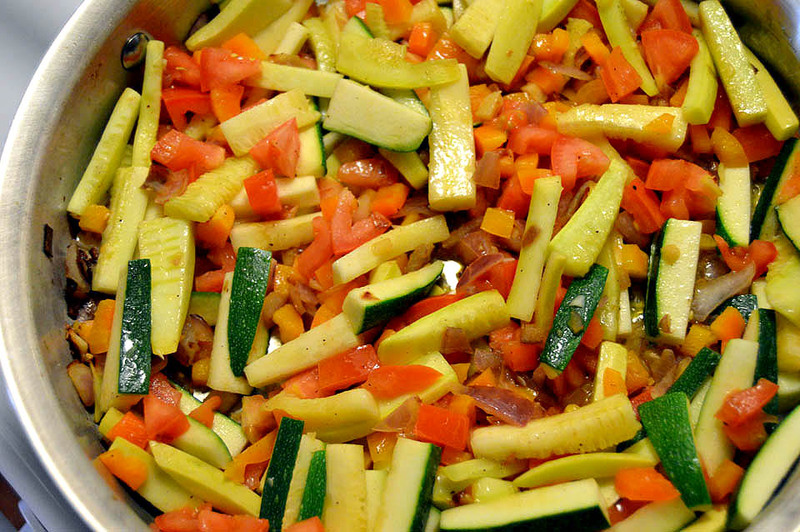 • Add the sliced vegetables into the skillet and let cook until they get soft, about 8-10 minutes. Add a little more olive oil, if needed, to prevent the veggies from sticking to the skillet. 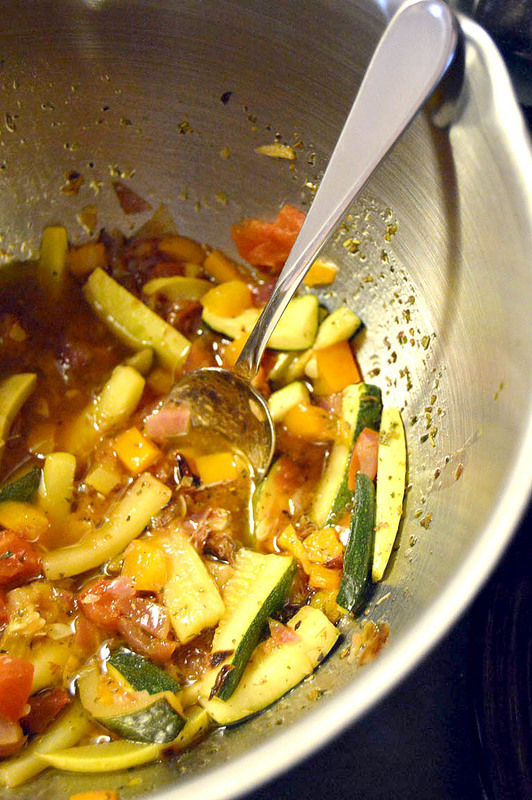 • Once vegetables are done, remove from heat and pour into the dressing and toss. Let cool for a moment.